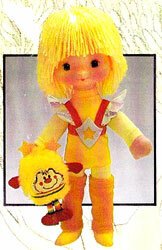 "Welcome to the colourful world of Rainbow Brite!" Images on this page thanks to nhtpirate, found on eBay or mine! 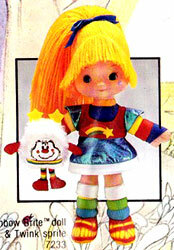 View all Rainbow Brite on eBay.com or eBay.co.uk ! 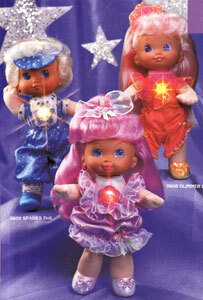 The dolls had soft bodies, large plastic heads and yarn hair. They were produced at various sizes. 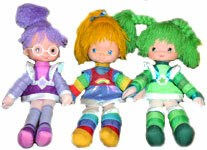 Three of the Colour Kids were produced at approximately 20 inches tall. 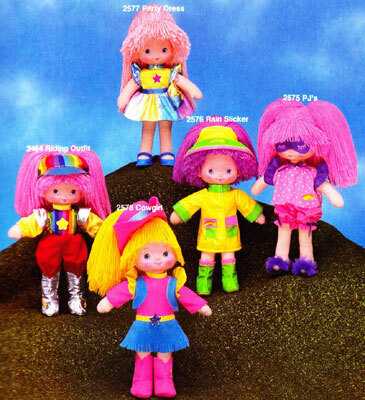 Four of the Colour Kids were produced at approximately 16 inches tall. 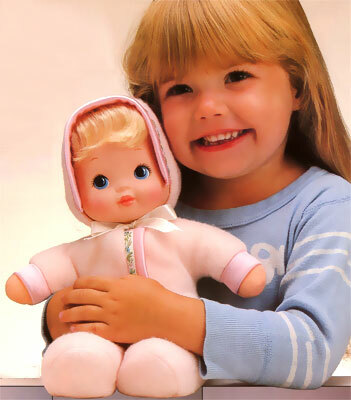 "She's lovable, huggable and bound to capture little hearts. And with her special bottle, she's lots of fun to feed. 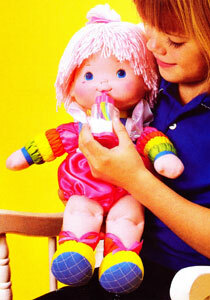 As Baby Brite drinks, children can watch the magical rainbow appear!" 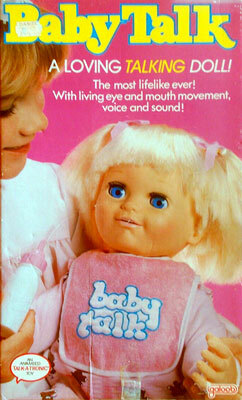 Baby Brite was also produced as a 16 inch doll. She came with a bottle and clothing. 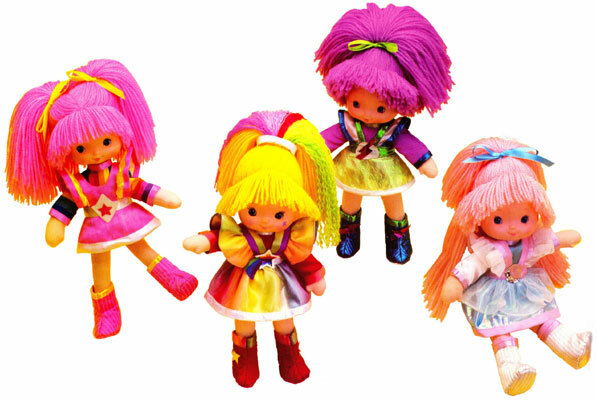 "These Colour Kids are bright and cheerful, with combable yarn hair. And each one comes with her very own story and sprite." 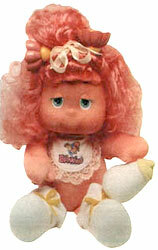 Dress-Up dolls were 9 inches tall and had plush bodies with plastic heads. 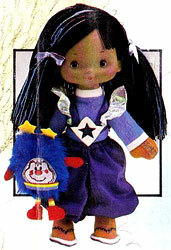 They had velcro on one hand to attach their Pocket Sprites to, but were also sold without their Pocket Sprites. 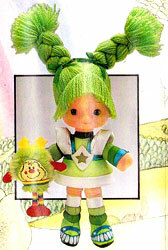 "This year, Dress-Up Rainbow Brite is even more colourful, with a rainbow hairpiece and shimmery dress. 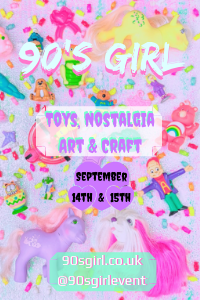 And she's having more fun than ever, because she has three new friends - Dress-Up Tickled Pink, Dress-Up Stormy and Dress-Up Moonglow. 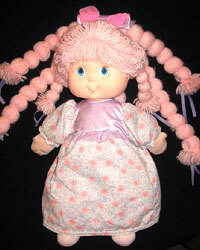 These 9" rag dolls have combable yarn hair and are completely dressable. 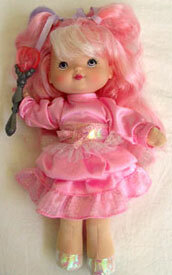 Each comes with a beautiful outfit, soft quilted boots and comb." 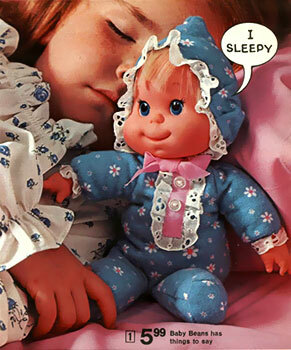 A 1986 toy catalogue shows a few new items due for release, but which never made it at all. 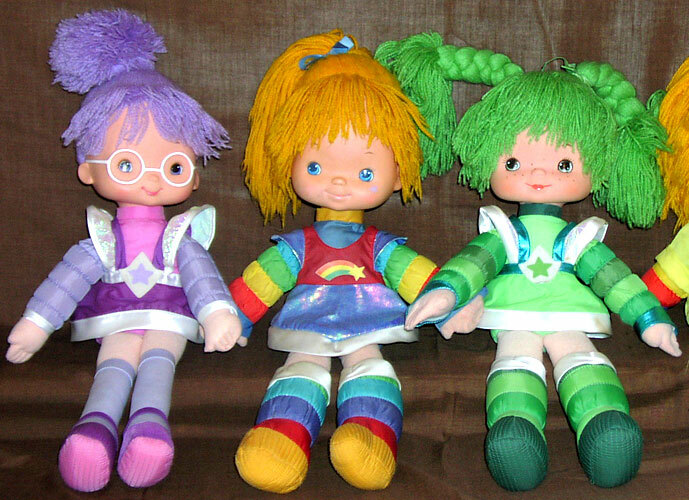 "Dress Rainbow Brite and her friends from head to toe! Colourful body suits! Shimmery dresses! Soft quilted boots! Special comb for styling hair! 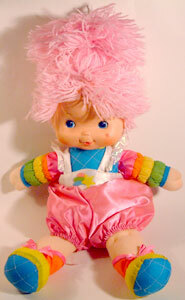 Rainbow Brite has her own rainbow hairpiece too!" 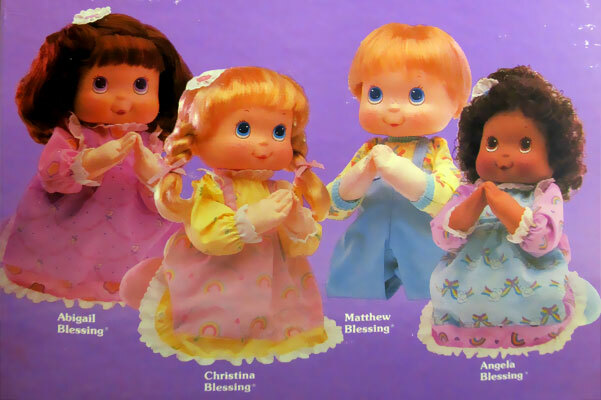 Four more Dress-Up Dolls were due to be added in 1986. 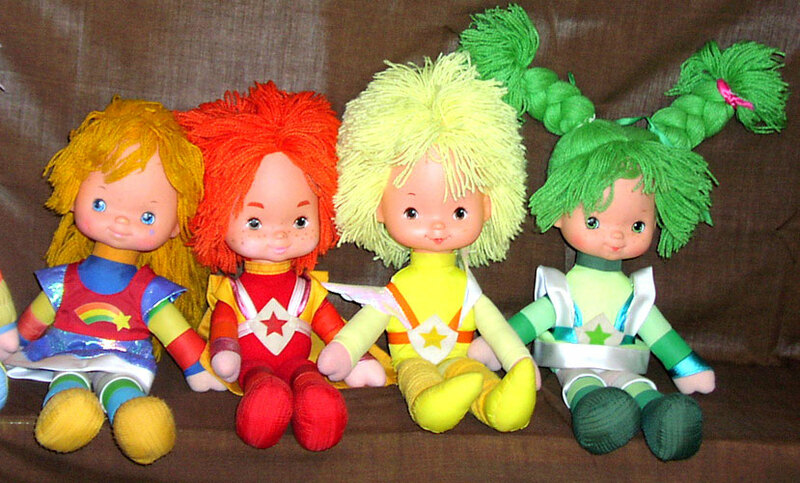 They were test marketed in specific countries (Moonglow in Germany and Stormy in Australia), but because Rainbow Brite was soon after discontinued the Moonglow and Stormy dolls were never made available to the general world-wide market. 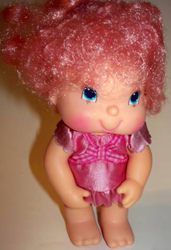 Tickled Pink was the only one to go into production, but is still hard to find. 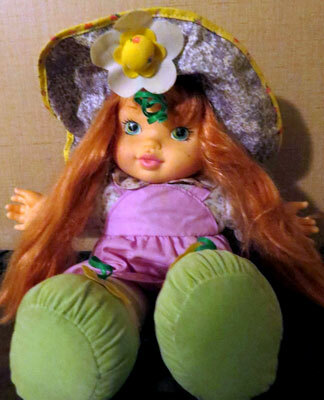 Although Moonglow dolls were extremely limited in production she does still exist (confirmed by Kelly who owns one), whereas Stormy was probably only made for the publicity shots. 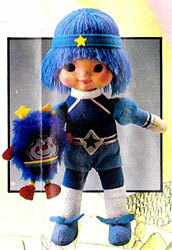 I don't know about the Rainbow Brite doll, but have seen images of her boxed. 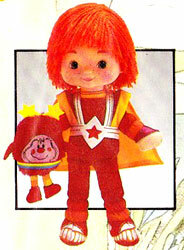 "Now Rainbow Brite and the Color Kids have a bright new wardrobe! 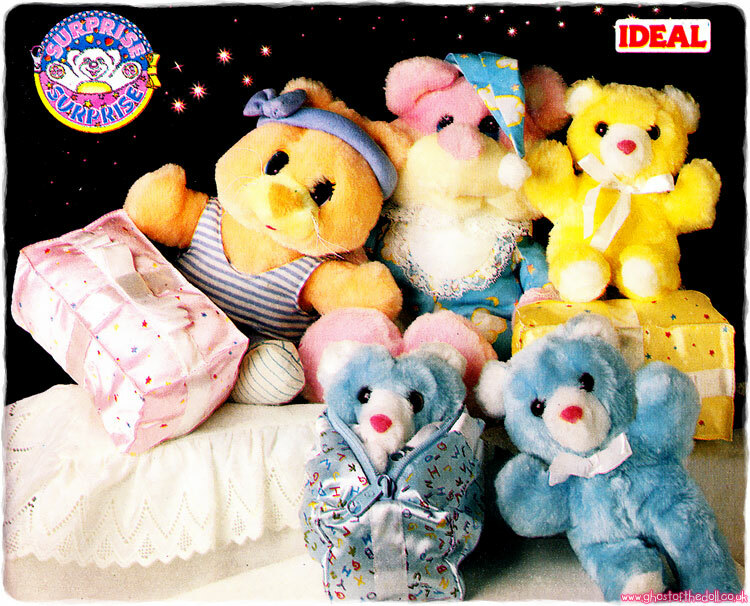 There are five colorful styles, one for every occasion in Rainbow Land." 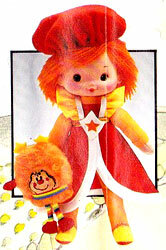 "She's Rainbow Land's youngest doll! Children will love combing her soft baby hair and dressing her from head to toe. Newborn Star comes with her own bonnet, booties, bib and comb."